Josh Mann, a Mammoth resident and avid backcountry skier, was ski touring in Esha Canyon on June 14 when, his legs burning from a long descent, he coasted to a stop and saw the skeleton of an endangered Sierra Nevada Bighorn Sheep. 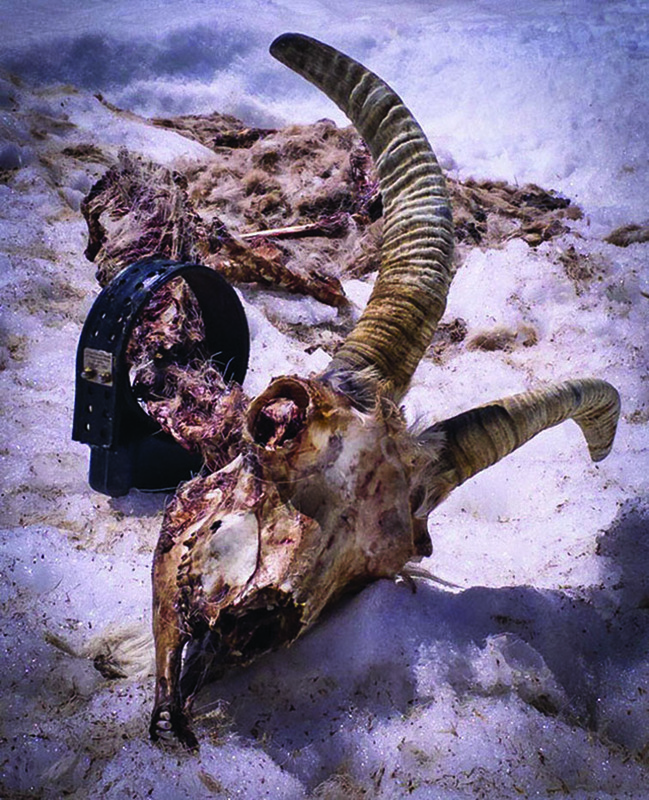 Mann snapped a photo of the Bighorn’s skull, fully intact, with a radio collar still attached to its neck. Once he got home, he called the U.S. Forest Service and the California Department of Fish and Wildlife (CDFW) to let them know what he had found. He said he found a second carcass that was “ripped to shreds,” and that officials who later called him to thank him for reporting his find said they found three more carcasses in the canyon. Tom Stephenson, Recovery Program Leader for the Sierra Nevada Bighorn Sheep with CDFW, told The Sheet on Thursday that the sheep found by Mann had most likely been killed in an avalanche. Efforts to reintroduce the Sierra Nevada Bighorn Sheep, whose population was nearly wiped out due to diseases introduced from domestic sheep, have ramped up in recent years, with a herd being reintroduced into the Cathedral Range in Yosemite in 2015. The subspecies of Bighorn Sheep was listed under the Federal Endangered Species Act in 1999, but recovery efforts began as early as 1979, said Stephenson. Stephenson said that, prior to this winter, there were about 600 sheep in the the native and currently occupied range, which spans from Olancha Peak in the south to Dunderberg Peak in the north and as far west as the Great Western Divide. Now the estimate is about 500 due to high mortality, though CDFW’s summer surveys have not yet been conducted. Mann said it was a rare find, and that he pinpointed the area on Google Earth for the USFS. He also said it got a little spooky once he found the first carcass.